The Skye Terrier is among one of the oldest terriers known today. In the early 1600s a Spanish ship wrecked off the island of Skye in the Scottish Hebrides. The ship had Maltese dogs onboard that survived and mated with the local terriers, resulting in the Skye Terrier breed. The dogs were used to hunt down vermin, fox and badger that would prey on the farmer's livestock. In the 19th century Queen Victoria took a liking to the breed and the Skye Terrier became very popular for a while, especially among the nobility. Others seem to believe that the Skye Terrier is actually a cross between the Celtic terriers and the Swedish Vallhund of the Viking invaders, or perhaps these breeds then mated with the Maltese. •	Generally a healthy breed. •	Good natured, loyal, polite, loving and affectionate. •	Brave, bold, spirited, playful and happy. •	Can be willful and need an owner who shows authority. •	Loves to chase ~ be careful with cats in the same house. •	Can be aggressive, suspicious of strangers, over-protective and obsessive barker. •	Can be a biter. •	Great for apartment lifestyles. •	Can be prone to back problems as they are twice as long as their height. Loving and affectionate, the Skye Terrier doesn't anger easily. Almost polite in nature and an easy going breed, this type of terrier is often seen at dog shows and breeding competitions because of its ability to interact with strangers without any troubles. However, this good nature must be nurtured from the early puppy years. The Skye Terrier needs to have extensive socialization with people when they are young in order to be calm around people. When the puppy is not raised in the presence of others, they can become nervous around strangers as well as overly protective of their family. Loyal in nature, the Skye Terrier is the perfect fit for a loving family that is able to give the terrier a lot of attention. In order to be happy, the Skye Terrier needs to have a lot of interaction with people. This will mean you need to play with this breed on a regular basis, and while it may be left alone, longer periods of isolation are not suggested. One thing to keep in mind is that the Skye Terrier who is nervous around strangers may have troubles when those same strangers go to touch them. These terriers can bite and bark at people they don't feel comfortable around, so this is something to realize when you are introducing your dog to friends and family. The Skye Terrier is also a natural chaser, which can lead to troubles in outdoor settings if they are not on a leash. They will run after smaller animals and other moving things, if they catch their eye. Other dogs can also become the target of their chase, if they feel they are being provoked. A bit aggressive with other dogs, the Skye Terrier is also prone to barking when it is upset or wants to express their discomfort. The Skye Terrier may not be the best fit for a home with children and smaller pets, as it can become a situation in which this dog becomes aggressive to these inhabitants. Unless you are familiar with the background of the terrier and know that it has been socialized, this may not be the best choice for this kind of home. But for the single or the older couple, the Skye Terrier is often a great choice as it requires little activity. It will also alert the owners of strangers, making it a great guard dog, if only for the barking alerts. The Skye Terrier would seem to be a dog breed that requires a lot of grooming with its longer coat, but the coat is actually designed to be resistant to tangling. However, this does not mean that regular brushing will not benefit their appearance. This long and straight coat can become matted if it's not brushed on a regular basis. Because of the smaller size of the Skye Terrier, little exercise is required. Simply moving from room to room is a lot of exercise for this particular breed. They can also become tired after being walked for long periods of time, so that's not necessarily a good activity for them. For people that don't want to have to walk a dog, the Skye Terrier can be a great fit. All is needed for this dog to remain healthy is a space in which they can walk around at their leisure. 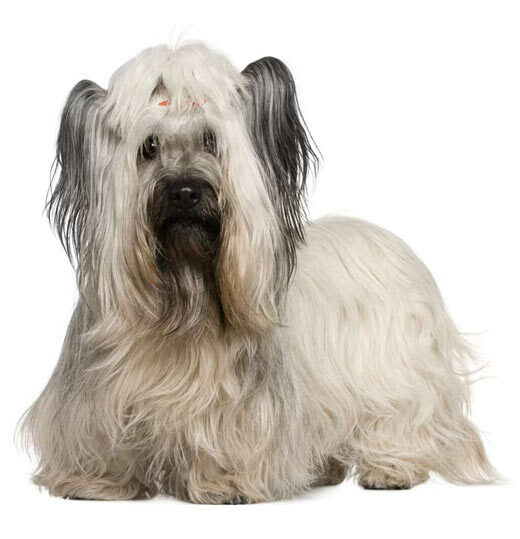 Older owners and those with disabilities that simply want a companion, but don't have the capabilities to manage an overly active dog breed will find the Skye Terrier to be a good fit. They simply entertain themselves by moving around, and don't need you to help them at all to remain active. The Skye Terrier has a high capacity for learning, so they can be trained quite easily with persistence and patience. Because of their loyal nature, they will need to be socialized with other people away from their siblings in order to learn how to handle strangers. This should be done when they are puppies to help them learn how to interact without barking or biting. The main techniques to use with a Skye Terrier are respect, consistency, and fairness. When they are learning, you want to make sure you are rewarding them consistently or punishing them fairly for the error. They will learn to be obedient, but you will need to continue their training throughout their life in order to see consistent results. While their problem solving skills are not ranked as highly as their ability to learn, the Skye Terrier is still a breed that will respond to training if you start early and stick with it. To help prevent their excessive barking tendencies when disturbed or when around strangers, you will want to make sure they feel comfortable. This can begin with introducing the dog slowly to new people and to new situations to see how they react. You can even reward this breed to help reinforce the good behaviors. However, if you are not consistent with your training, you might find some of the negative behaviors coming out in your Skye Terrier: excessive barking, willfulness, suspiciousness, aggressiveness, etc. You might want to remember that the Skye Terrier is not a dog breed that will do well in extended training situations. They can become easily bored, so you will want to always change up the training session or intersperse it with other activities that don't require a lot of focus. Other skills that you can develop with a Skye Terrier include tracking and feats of agility, so this might be a good way to focus their training.